Sikhism is a religion based on the teachings of Guru Nanak Dev and the following nine gurus (teachers). All these teachings are compiled in the Holy Book known as the Guru Granth Sahib which serves as the eternal guru for Sikhs. It was decreed by the tenth guru, Guru Gobind Singh Ji that the holy book would serve as the eternal guru for the Sikhs as it contained the teachings from all the ten gurus, thus, making it the eleventh guru (teacher). Christianity is a religion based on the life and the teachings of Jesus Christ and the adherents of the faith are known as Christians. Christians believe Jesus to be the Son of God and the god himself at the same time. He is referred to as the Savior of Humanity. The death and resurrection of Jesus Christ are the two core event that much of the Christian Doctrines are based upon. The Holy Bible which contains details on the life and the teachings of Jesus is the holiest book regarded by the Christians. Christianity is the largest religion in the world being practiced by almost a third of the population with Sikhism being the fifth popular. When the Sikhs (followers of Sikhism) are baptized in a Gurudwara (Sikh temple) they are required to always wear the five K’s. The five K’s being Uncut Hair, Comb, Iron Bangle, Dagger and a special undergarment. These five K’s are believed to have been based in the time when the Sikhs were engaged in bitter battles against the mughals and could be identified by these items. The Christians are baptized in churches by partially or fully immersing the person in water and do not have any specific requirements thereafter. The baptism is believed to be a form of purification and a method of inducting the person in the faith. Christianity began as a Jewish sect and evolved from there on. The basic teachings of Sikhism regard God as ‘Nirankar’ meaning shapeless, timeless and sightless and the concept of ‘Ek Omkar’ signifying one universally present God. Sikhism believes all human beings are created equal and does not discriminate based on caste, colour or creed. It also preaches that one should lead a disciplined lifestyle and attain a higher level of self awareness through meditation. One of the key teachings pertain to maintaining a balance between Work, Worship and Charity. The concept of distributing free meals in the Sikh temples is also an integral part of the religion. Christians believe that the God was the father, Jesus the son and the holy spirit. Other beliefs of Christians include the concept of Heaven or Hell after death, resurrection, Holiness of the churches, communion of saints, judgement day and salvation for the faithful. These form the basis of all teachings of Christianity. The concept of group worship like weekly sermons at churches is also widely practiced. 1.Sikhism is based on the teachings of the ten Gurus contained in Guru Granth Sahib while Christianity is based on the life and teachings of Jesus Christ regarded as the Son of God contained in the Bible. 2.Christianity is the largest religion in the world with Sikhism being the fifth. 3.Sikhs regard God as shapeless, timeless and sightless while Christians regard Jesus as the God. 4.Sikhs need to follow a very strict code regarding the five necessary items to be worn at all times, however, no such code exists in Christians. 5.Sikhs try to attain salvation through balancing work, worship and charity while the Christians try to do this by following the teachings of Jesus from the Bible. N Amit. "Difference Between Sikhism And Christianity." DifferenceBetween.net. August 7, 2010 < http://www.differencebetween.net/miscellaneous/difference-between-sikhism-and-christianity/ >. Sikhism is continuation of Christianity and I have proved it through my Youtube Videos. Sikh stands for a student and there is only in a million who is a true Sikh. There are more similarities between Christianity and sikhism than differences. ( Tu maat pita ham baarik tere. Tu mera pita tu hain mera mata.) So christ is the son of God. Why to disagree. Gurbani also states that a true guru and God is one and so is Christ, God the savior. ( Gur parmesar eko jaan )The book of psalms in the old testament is like shabads in SGGS in poem form. Also Christianity had influence on Islamism and Islamism could have influenced sikhism indirectly by Bhagat Kabir’s or Baba Farid’s writings or other Hindu saints or Guru’s writings. Eko jaan) So christ is the guru, the savior, the God. The book of psalms is like shabads from SGGß. 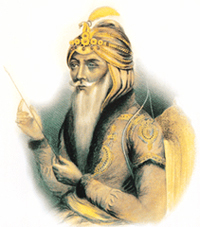 Sikhism may have been influenced by Christianity through islamism. It’s not that difficult. It begins with submission to God. Keep it simple. The principles of character and worship are the basics for both. The stumbling block is belief in Jesus as The Christ and savior of mankind. Christianity may have influenced sikhism indirectly through Islamism. It agrees with Christ being the GOD, the savior, the son. ( tu maat pita ham baarik tere) So every human is son or daughter of God. Jesus is a saint, guru one with God. ( Gur parmesan eko jaan) The book of psalms is like shabads in SGGS, in praise of aatma, parmatma, satguru, saadh Sangat. Why would a follower of the supreme Guru even think of coping christian dogma ?They worship a dead saint.Yes,he is dead,yhey have his grave in kashmir,his bones are in,KASHMIR!! Jesus had a form,ate bread,and worshiped SatGuru,but he was not God,and onley manmukes and fools claim otherwise.We worship Waheguru and WaheGuru dwells amongst us in every place and manifests his presence in Siri Guru Granth Sahib Ji. Who could ask for more? WaheGuru ji ki Khalsa,Whaheguru ji ki Fateh!!!!! Ignorance can nevwr be hidden. Denial does not make a fact. Bible is the most researched and studied Book in the world. Every time an attempt has been made to prove the Bible wrong, it has only proved it right. This goes with archeology, the scriptures and the resurrection. I will pray for you as instructed by Jesus. May the light shine on you and you know the truth. I am inspired by the information I found on this page. Christians, people who have been saved by the blood of Jesus, are not saved by works, but only by believing, repenting and turning from sin and following God alone. Then from there they grow in a relationship with God and continue to follow Jesus’ teachings. There is nothing we can do to earn salvation. That is why Jesus had to die, to suffer our punishment of our sin. Through this, only, could we be saved and go to heaven.